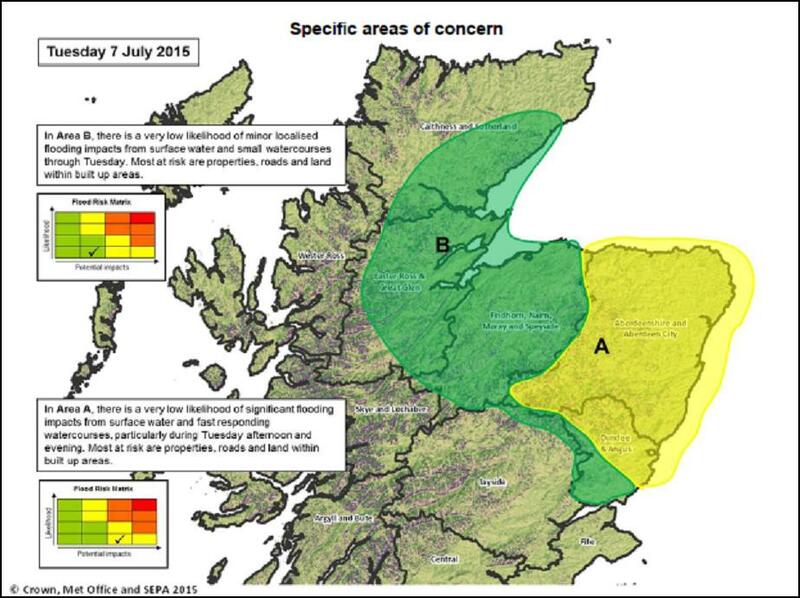 This blog entry is repeated from the Scottish Flood Forecasting Service, the original can be found here. As noted in previous articles surface water flooding can be challenging to forecast. 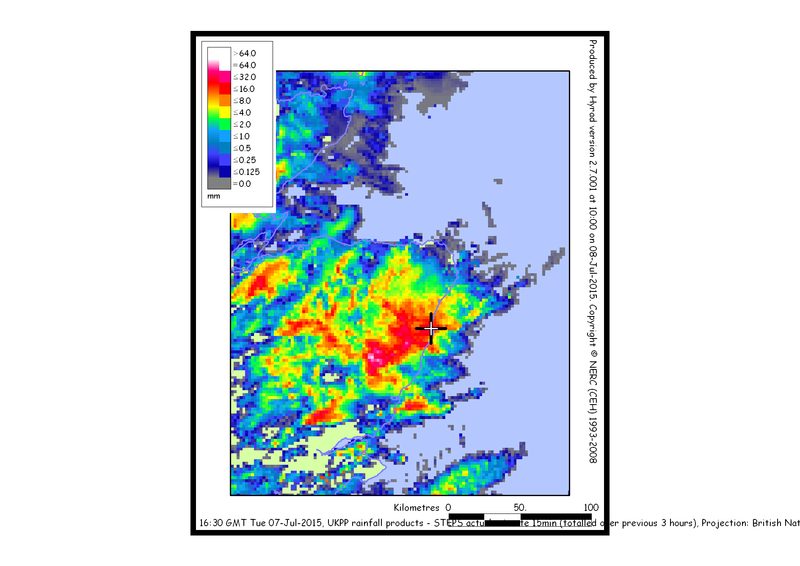 On Tuesday 7th July a period of intense rainfall over Aberdeen and the surrounding area led to significant surface water flooding. The forecasting service was able to provide timely guidance and alerts. The threatening weather situation leading up to the flooding in Aberdeen was initially forecast the preceding weekend. 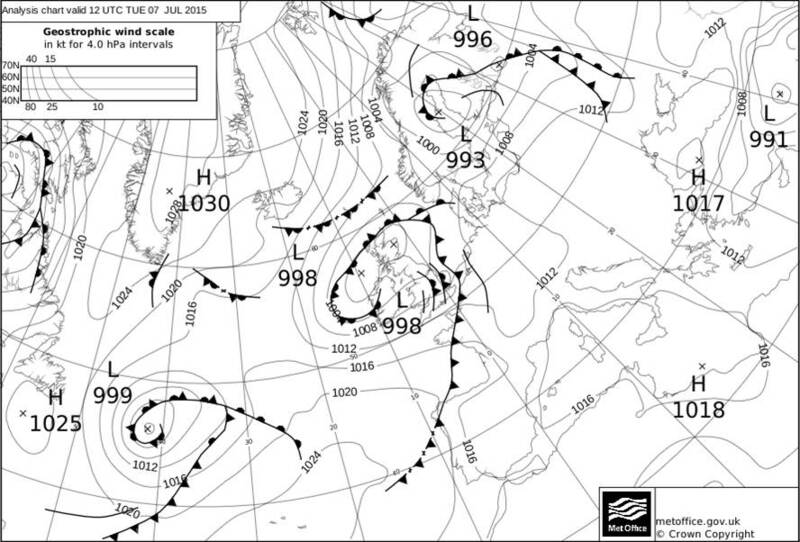 In the build up to Tuesday, an associated low centre was expected over Aberdeenshire and Aberdeen City. The airmass was relatively moist and potenitally very unstable. Many of the conditions for localised downpours were evident. Namely, unstable air, warm daytime temperatures, slack flow and some changes in wind direction aloft. On the day, temperatures quickly reached the values required to set off the heavy and thundery showers. Initially over high ground to the southwest of Aberdeen, gradually drifting northeast over the city. The showery procession may also have been reinforced by ‘convergence’ along the coast. A sea breeze effectively adding impetus to an already fraught situation. A process called ‘back-building’ may also have played a part. This is when a shower cloud sets of ‘daughter cells’ behind it as it moves with the main steering flow. Met Office weather predictions models were suggesting some high rainfall totals over a short period of time and these predictions were reinforced by associated probability forecasts. The exact location, intensity and timing of heavy showers are notoriously difficult to forecast. 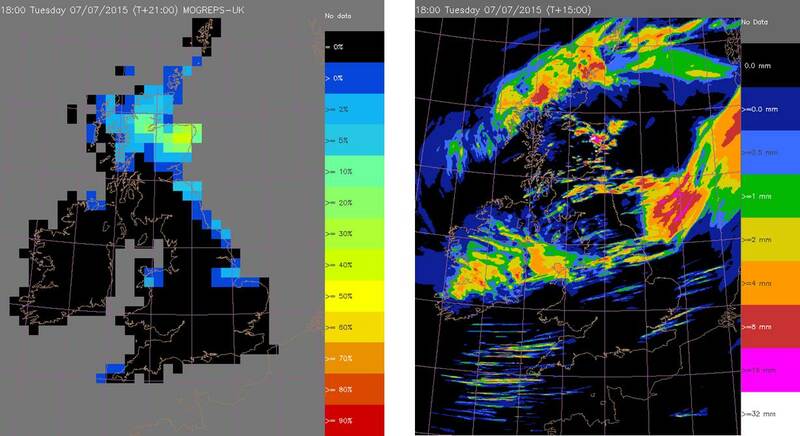 Scottish Flood Forecasting Service (SFFS) meteorologists and hydrologists did however decide there was enough evidence to warn of the risk of significant ‘surface water’ impacts on the preceding Monday. This risk was repeated in the SFFS Flood Guidance Statement and accompanied by alerts on the day of the flooding. The event caused significant disruption. Impacts included flooded properties, roads and commercial premises, including a shopping centre. The airport terminal was flooded, as was a dogs’ home. Children had to be evacuated from a nursery. The rainfall was of the order of 10mm in 1 hour, or 20mm in 3 hours, as recorded at various gauges and by the nearby Hill of Dudwick rainfall radar. At individual locations, this would indicate a return period of around 5 to 10 years, however given the relatively widespread nature of the event, with these totals being recorded over several square kilometres, the actual return period of the event could be much higher. Taken as isolated spot values, and comparing with our depth-duration guidance thresholds, these figures would normally indicate expected impacts in the minor category, but given the widespread nature of the rainfall, it is unsurprising that impacts were significant. The cumulative effect of this event following another heavy rainfall event on the preceding Saturday, and the high tide restricting drainage from some areas, may also have increased the severity of flooding. 3 hour rainfall accumulation from radar. Widespread 20mm totals. Given the current availability of tools and resources the forecasting service performed very well. However the less predictable and smaller scale event (with mainly minor impacts) in Aberdeen just three days earlier did not get the prominence it perhaps deserved, meaning there is still quite a lot to do to if the Scottish Flood Forecasting Service is to have a comprehensive, consistent and accurate capability in the difficult and challenging area of surface water flood forecasting. The forecasts (particularly the Heavy Rainfall Alert tool) suggested there was >40% probability of significant impacts for the 32x32km grid square in which Aberdeen is located at one corner. This would have yielded a medium (amber) flood risk on the Flood Guidance Statement, however as it is sometimes felt that extreme event probabilities can be overdone, a lower probability was assumed for the urban area. A new version of the HRA tool, which comes online for use by the forecasting service later this summer, will better target urban areas and make this kind of decision making a little easier. A detailed surface water flood risk mapping tool, similar to that used in Glasgow for the Commonwealth Games last summer, would also improve forecasting of this type of event, and we plan to further develop the scope of this model in future. This blog entry is repeated from the Scottish Flood Forecasting Service, with the permission of the author, the original can be found here. This entry was posted in Uncategorized on July 14, 2015 by Rob Thompson.